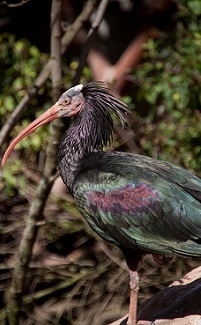 The Waldrapp or Northern Bald Ibis is considered sacred in Egypt. Their image appears in ancient Egyptian hieroglyphics and tomb art. The long, thin beak is used to probe mud for small prey. Depending on its sense of touch while, the ibis can use its eyesight to watch for predators. Population decline is due to loss of habitat, uncontrolled hunting (their meat is considered a delicacy by some), pesticides and climate change. These birds are highly social and will mingle in large flocks. Both sexes incubate eggs. To find out more about the two waldrapp ibis chicks that hatched at the zoo in April 2015, CLICK HERE!